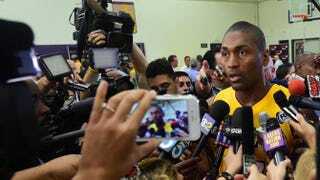 Metta World Peace of the Los Angeles Lakers is interviewed during the Lakers’ media day Sept. 28, 2015, in El Segundo, Calif. It seemed as if Lamar Odom was barely hanging on to life last week after a suspected drug overdose at a Nevada brothel, but over the last couple of days, according to various reports, he’s been on the road to recovery. Everyone from Master P to Kobe Bryant has shared his opinion about those people who have came forward to visit Odom in his time of need, but now his former Los Angeles Lakers teammate has something to say as well. World Peace said that he’s put off visiting Odom because of the media circus surrounding the hospital where Odom is being treated, but he has been getting updates from his brother Daniel Artest, who has been visiting. Odom’s former teammate also wants people to realize that the only people who should matter right now are Odom’s children because they now have to wait in line to see their own father. Odom’s children definitely should receive top priority when it comes to seeing their father, and it’s disappointing to find out that they’re not. Last week, in a statement to CNN, his children, Destiny and Lamar Jr., thanked everyone for the prayers they’ve received.